I can actually pinpoint the moment that my life changed forever. That one moment when all the blocks fell into place and I began making the changes that would reshape me as a person, and open up an entire new world of opportunities. It sounds ridiculous, because I'm not stupid. I'm also not incapable of using Google. All of the things I am now applying, almost all of them I knew before. Almost all of them had nestled themselves in a dark corner of my mind, where I chose to ignore them. I had also been ignoring the reappearance of my eczema; the stomach upsets that never really seemed to go away; the brain fog; the sluggishness; the lethargy. I was becoming more miserable and irritable and quite frankly a bit of a pain in the bum. I started to not be able to see the good things in people, particularly those close to me. All I saw were the irritations, the problems. Inaction definitely breeds more inaction. And then it breeds lethargy in all other areas of your life. I had stopped really working at the important things in my life, and was just moving from day to day. I had taken my family and friends for granted and most importantly, I was neglecting my marriage. The moment my life changed was when I sent one email. One small email to hq@circuitfactory.ae. Signing myself up for "The challenge". The Challenge is the Circuit Factory's weight loss program. It last for four weeks (or two weeks if you are doing the mini challenge) and alongside four sessions of the Circuit Factory a week, you are expected to follow their diet plan. My introduction to clean eating began here. 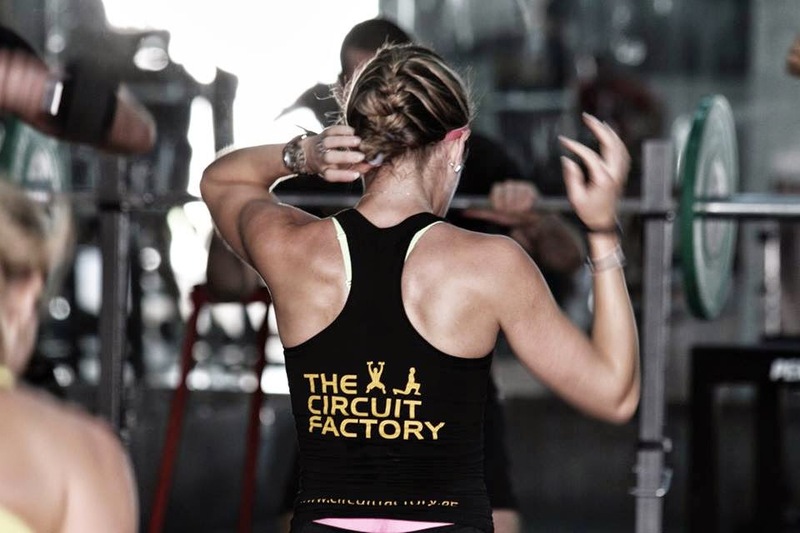 As the Circuit Factory continually reminds it's participants, it is 80% diet and 20% exercise that yields results. So I could continue to work my bum off in session after session, but I was not going to see the results I wanted to see while I was eating all of the wrong things. I'm sure no one is surprised by that list. I wasn't. But even though I knew it, I just wasn't doing it. So essentially, eat no crap. Eat foods that are good for you and good for your body. Not rocket science. Except this time, when the challenge started, the emails started too. Emails which contained so much information that it made my head spin. They arrived at 5am every morning, so I was in complete information overload by 6am. The truth about food. About where it comes from, and about what companies do to it in order for it to make them the most money. I have never been so shocked by what I was learning, and even more shocked about why it hadn't occurred to me before. Take chocolate for example. Milk chocolate. It should be made with... well, milk? Ok, so would I take a bottle of milk out of my fridge, leave it on the counter for a month and then drink it? No I damn well wouldn't. Because it would be absolutely rancid and foul. And not just because I have a real issue with milk that may be even slightly off, but because it would be beyond consumable. And yet I am perfectly happy to buy milk chocolate which has been sitting on the counter in a shop for months on end, and eat it. Why has this never crossed my mind before? Surely that can't really work? But it does. It does because the food companies have found nifty little things called preservatives that extend the shelf life of food. Food companies have managed to find preservatives that can stop Mother Nature in her tracks. So the question that finally springs to mind is: If the preservatives can stop Mother Nature from degrading the chocolate, Mother Nature who can creates a Tsunami, who can wipe out half a city with an earthquake, how on earth is my body supposed to digest it? The answer is, it doesn't. Not really. Not properly. My body cannot process all of the chemicals that is in processed food because it doesn't understand them. And finally it clicked. My body only runs because of the food that I put into it. If my body is working hard to deal with things that aren't supposed to be there, how is it supposed to have time to actually function properly? It only has so many hours in the day, much like the rest of us, and it has an extraordinary amount of work to get through. To get the most out of my body, I have to put the right things in. The right things are simply the things my body has been built to digest. Real food. Food that does not come out of a packet. Food that comes out of the ground and from an animal. The way nature intended it. So I completed the mini challenge. I lost six pounds in two weeks and lost four centimetres from my waist. I am by far not the biggest weight loss from that challenge, but I didn't just lose the weight, I gained muscle. I went from walking a mile in 20 minutes 57 seconds (that's not a typo) to running a mile, the whole mile, in 11 minutes and 8 seconds. I can shoulder press 10kg weights and do full press ups (not on my knees). I am fitter than I have ever been in my life and the difference in both my physical and mental state is radical. I have had to make some further diet changes because of my thyroid problems, but other than that the Circuit Factory has been the one thing that has illuminated the path ahead and shown me the only way for me to be healthy and strong for myself, my husband and my children. 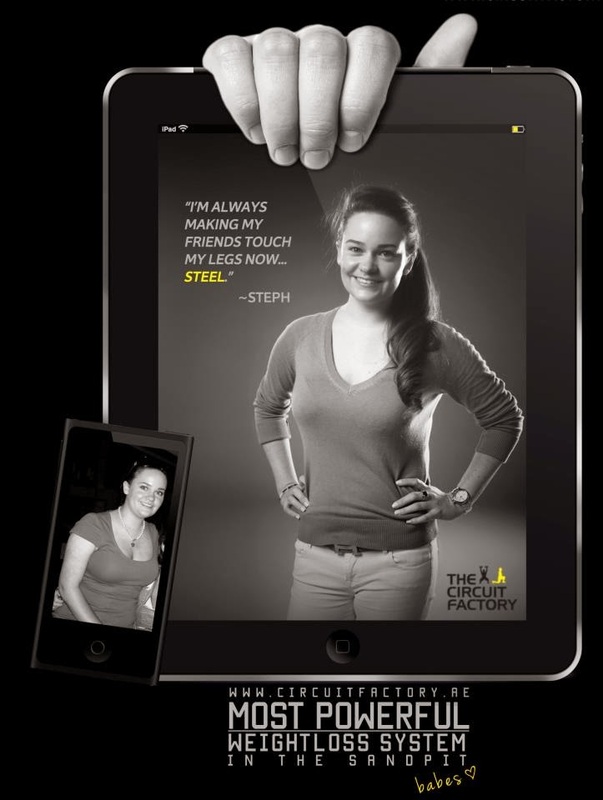 The Circuit Factory - Changing more than just the numbers on the scales. It’s only when you live in Dubai that you realize exactly how easy life can be. Everywhere delivers…. And I mean everywhere. McDonalds actually deliver here. Other people pack your bags in the supermarket, put them in your trolley, wheel your trolley out to your car and finally load it into the car for you. That’s if you have bothered to go to the supermarket at all. You can just phone up the shop and they’ll send everything to your door. This is the only place in the world where we can afford to have full time help. We have an actual housekeeper. Who, by the way, is worth her weight in gold. She cooks, she cleans, she irons. Our apartment is immaculate…. All the time. With a two year old and a six month old, that is nothing short of spectacular. When she goes on holiday, we are literally bereft without her. And that’s without even mentioning the crumbs. I had no idea that toddlers came with such an ability to pulverize absolutely everything into pieces the size of grains of sand. But all of that convenience, and all of that help means only one thing. We are getting fatter. They actually call it the Dubai stone, because that’s the average amount that people put on once they land in this playground in the sandpit. So, take me, a chocolate addict. You are talking to the person who used to diet by replacing proper meals with chocolate, full fat, full sugar, milk chocolate. Put her in the sandpit, with all the convenience and ease that is available to her. Then add in not one but two hyperemesis filled pregnancies. For those of you who are lucky enough to be completely oblivious to what hyperemesis is, it is extreme morning sickness. By extreme, I mean vomiting multiple times a day, and feeling nauseous for the rest of it. Apparently it only affects 3% of the population, but if you are unlucky enough to be part of the 3%, it feels like the entire world is coming to an end. Even on anti sickness medication, I felt like I had en eternal hangover. I was constantly on the edge of needing to find a bathroom and all I wanted to do was eat my own bodyweight in McDonalds. And that is pretty much what I did. Apart from the hundreds (I’m not exaggerating either) of packets of salt and vinegar Lays that I ate in the first trimester (they seemed to help the nausea when nothing else did) I ate McDonalds at least twice a day (or a similar substitute) for both of my pregnancies. Lucky me, I had hyperemesis for the first 24 weeks with my daughter, and then for the full 40 weeks with my son. I kept waiting for the nausea to subside so that I could “be good” with my diet. But by the time I reached 24 weeks during my first pregnancy, that damage was done. No amount of gentle exercise was going to help shift the weight. The final trimester I put on the expected ½ a pound a week, which was just my daughter growing but I had already put on more than enough weight for two women. During each pregnancy I gained 28KGs. Roughly 4.5 stone. That is a LOT of weight. No matter how good I said I was going to be, the calling of fast food was too much and I gave in. After my daughter was born, I managed to drop the weight by using my “replacing meals with chocolate” scheme (I know, literally the worst diet ever) in the first five months after giving birth. But I was loose, not toned and was still extremely unhealthy. When my son was born, I was so mad at myself. I had let myself gain 28kgs during my second pregnancy, and I was not happy about it. But this time I decided I needed to do things properly. That my health was important, not just for me, but for my husband and my children. My kids needed me to be able to pick them up, carry them around and generally be there for them. I wanted to be able to run round after them, and most importantly, to set them the example that I wanted them to follow. Gary had been going to an ever growing phenomenon called The Circuit Factory (www.circuitfactory.ae ) and had not stopped raving about it since he had started going. I was less than impressed. It was a “circuit class”, with running. I am so bad at running, I hate it with a passion and I am not good at it. As for circuits, watching Gary do one burpee made me feel slightly sick. I have no upper body strength, and press ups literally make me want to cry. But Gary sent me a couple of pictures of the transformations that were happening inside this “circuit class”, and even though I really really didn’t want to, I was a little bit curious about whether I too could become one of their transformations. I won’t lie, when I arrived at the school where the classes were being held, I almost ran away. There were 10 instructors standing around waiting for the newbies to show up, so they could take them through the drill. Not just 10 instructors that you’d see in the gym, but 10 of the leanest, fittest, intimidatingly in-shape instructors you have ever seen. They made me want to simultaneously run away and hide and rooted me to the spot. I stayed and endured the first class. I have never worked so hard in my life as I do in those Circuit Factory classes. They do a mile run as a warm up, followed by at least two rounds of circuits. After the run I want to curl up in a ball and die, but I’m soon marching back into the hall with everyone else and even though I don’t think I can, somehow I work my way (at my own pace) through the circuits and collapse at the end of the class (occasionally after a round of Sally – if you don’t know what that is, don’t ask, you really don’t want to know). The instructors are what make a Circuit Factory Class. There are sometimes 140 people in a class, and the instructors know most of them by name. They know exactly what weights I am lifting, and don’t hesitate to tell me when it’s time to pick up the heavier one (admittedly I am “wife of” Gary, who spends his life asking the instructors to make the class “a hard one”, invoking their wrath – so I’m pretty much marked with a target!). A lot of the instructors are former participants in the class, and several of them are the people whose transformations made me turn up to that first class. They have done it, and they have maintained it, and gone on to encourage, support and occasionally harass the class members to work harder and smarter. My transformation is taking longer than expected, owing to a bout of bronchitis, tendonitis in my foot and a two week holiday, but I am working hard on the body I want to keep. It’s not an easy road, but it’s the right one. As you’ll see from my next post, The Circuit Factory is not just about the classes, it’s about the lifestyle. I think that is what makes it so addictive, they are changing people’s lives, not just the numbers on the scales. …and how did you come to write this blog. This is assuming that there are some of you reading this who are not my close friends and family (who will feel they have to read it, no matter how awful it may be! ), and you do not have a clue who I am or why I am writing this blog. Although if you have read my previous post you will know that I can’t seem to shut myself up, so spilling my words over onto the internet is probably the next logical thing for me to do. My murky little story, as murky little stories always do, starts when I was a teenager. In quick succession I came down with glandular fever and then was involved in a serious car accident on the M6 motorway, involving a huge multi car pile up, lots of debris and a four hour standstill on the motorway. For those of you who are not from the UK (or those who are but are fortunate enough to never have encountered the M6), the M6 motorway is the busiest motorway in the UK. This also makes it one of the most dangerous. Particularly for 17 year olds who have only just passed their driving test and who think they are perfectly capable of navigating their way along the M6 to college. I didn’t know it at the time, but those two events would turn out to be life changing in a long-term and (in the beginning) subtle way. As several years passed, I became more and more and more tired. The 18 year old who used to work from 3pm-11pm in a pub, go out with the rest of the staff to the local night club, get home at 3am, and yet still get up at 6am and head into work with time to go and collect the obligatory morning papers on my way in, was long gone. That is one huge list. When I look back at it now, I always think “how did you not know that something was wrong”. It feels like it was staring me in the face all the time and I didn’t see it or acknowledge it. The truth is, when you actually look at each of the symptoms in isolation, they don’t really tell you anything. Lots of those symptoms could be as a result of poor sleep, poor diet, not enough exercise, which all would have applied to me at that point in time. I had been to my GP (General Practitioner – the doctor you see first who considers your symptoms and carries out some tests before deciding if you need to be referred to see a specialist) on several occasions and I had a whole battery of tests done. They all came back negative…. Except for one. I had a blood test done for thyroid antibodies. I think the level should be below 60 to be normal. Mine was, and for the decade since, sitting in the low 300’s. Yes, the low 300’s. Quite a bit above 60. Yet the standard blood test which measured my thyroid function (TSH – Thyroid Stimulating Hormone) was completely normal. It turned out I had an autoimmune disease called Hashimotos disease. My body had decided that my thyroid (which is the gland at the front of your neck) was a foreign body and had decided to attack it (causing the raised thyroid antibodies). This caused my thyroid to not operate properly and did not provide my body with the hormones that it needed in order to function. Even stranger, my thyroid was so out of sync with the rest of my body that my pituitary gland (which produces the thyroid stimulating hormone) was not recognizing that my thyroid was not providing enough hormones, and so was not asking my thyroid to work harder (increasing my thyroid stimulating hormone past normal levels). In short I was a mess. My endocrinologist’s first question to me, the second I had sat down in his consultation room, was whether I had been in a car crash or had glandular fever before all my symptoms had started. He was not surprised when I said both. Apparently they are the leading causes of thyroid problems, in someone who was already vulnerable to thyroid problems. Along with running marathons. Which I have never done, and which he instructed me never to do, instructions I follow with great ease! As with any autoimmune disease, the road back to full health is long and full of bumps along the way. A decade on from my diagnosis and I am still learning. 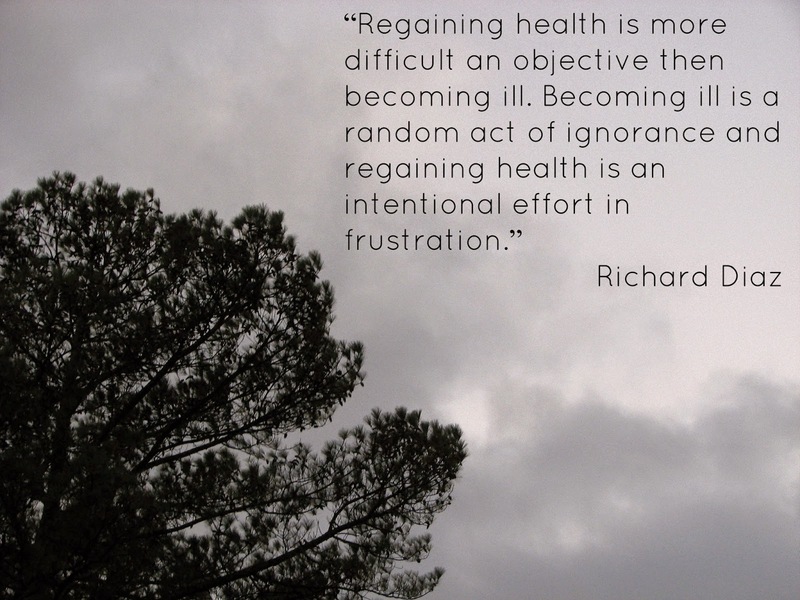 I’m learning that it’s not just as simple as replacing the thyroid hormones with tablets and getting on with my life. That what I put into my body, day in and day out, is just as important, if not more important than the tablets I take. That supporting my thyroid and the tablets (so that they can do their job) takes dedication and a complete change of mindset. I have made more changes in the past 12 months than I have made in the last decade. I am already reaping the benefits of those changes, and I hope that I continue to do so. First of all, I talk too much! That is pretty much the most important thing you need to know about me. I can literally talk the hind leg off a donkey. Why use one word when about seventy five will do! It is, most definitely, an inherited trait. My mum can talk to anyone about practically any subject you can think of. Luckily she’s hugely intelligent and when she talks she is articulate and, most importantly, interesting. When my mum talks, people listen. So she is perfectly suited to her work as a lawyer (and she’s a damn fine one at that!). If I am only half as articulate and interesting as her, this blog will be an amazing place to be. If I’m not… well you probably haven’t even read this far down. Assuming you are all still with me (or at least some of you), the one thing I hope is that I listen just as much as I talk. I absolutely love connecting with people, engaging with them and being involved with their lives. I like to think I’m a good friend, that’s what I strive to be, but to be a good friend, you need to know when to shut up and just listen. I know I’m better at talking that I am at listening, but hopefully, with some more practice, I’ll be just as competent at listening. In writing this blog, I hope that it engages you and that you find some of the content useful and occasionally informative. I also hope that when you take the time to comment, that I listen and take on board what you have to say. As with anything in this world, it’s not a one-way street and if I want you to read my blog, I need to make sure I’m talking about the things you want to read about. That the information I’m providing is worthy of your time and attention. For those of you who are not from the UK, I apologise for my British spelling and the use of phrases, which I am sure are completely alien to you. Please feel free to let me know where I have baffled you, and I’ll do my level best to translate it for you! And because life is much better in colour, here is the view from my window. Picture taken by the amazing Melissa Beattie!